Autos and taxis in Mumbai (India) will soon sport a QR Code embossed on the compliance plates of CNG (Compressed Natural Gas) tanks. A Compliance Plate is a metal plate that is fitted on the tank surface and displays information such as vehicle number, tank year make, and last testing date. The city’s transport department took this step to ensure the safety of its commuters. If you are a citizen of Mumbai and you commute using a CNG auto or taxi, you are living dangerously. These autos and taxi operators have to get their CNG tanks tested every three years—for leaks, defects, etc. However, a staggering 30% operators don’t do it, even though they can only refuel after the CNG pump operator verifies their valid Compliance Plate. This is because the cost of testing is currently INR 4,000, which according to the operators is very high. But how do they get away with this?—With the help of roadside mechanics. The mechanics simply edit the details on the Compliance Plate. The CNG pump operators are not able to differentiate between valid and forged plates. The State Government has requested the testing agencies to reduce the cost from INR 4,000 to INR 1,600. The Government expects that this will increase compliance amongst violators, which currently stands at 30%. However, it is still unclear who will bear the loss of reducing these prices—the Government or the 22 testing agencies in and around Mumbai. As an added measure, the authorities are also planning to add a QR Code on the Compliance Plate. This code will probably be encoded with relevant information such as Vehicle Number and Testing Date. The CNG pump operators will now be required to scan the QR Code. And they’ll also need to match the decoded details with the information printed on the plate. While it is easy for mechanics to tamper with the printed information on the plates, they will not be able to tamper with the QR Code. In Apr 2018, a meeting was held by the Transport Department of Mumbai, auto-taxi unions, and CNG fitters to discuss this matter. Using QR Codes to enhance compliance is an excellent initiative. However, the execution still remains to be seen. 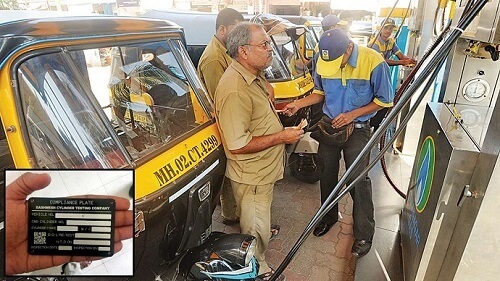 For example, will the CNG pump operators have a smartphone, which is required to scan a QR Code? Will they be educated on how to scan the QR Code? Will the information be encoded directly into the QR Code or stored in a secure database? The authorities will first need to streamline the process to ensure better compliance and safety of its citizens. Like Mumbai, other cities in India are also using QR Codes for passenger safety. This is one way how India is using QR Codes for various use cases.